At the heart of this module is a sailing voyage. We will visit coastal/island communities, explore marine environment, and experience life at sea and on remote islands. During that time, as well as at pre- and post-voyage seminars, we will reflect on diverse but inter-related issues in historical and contemporary perspectives: the roles of the sea and boats in Southeast Asia; archipelagic spaces and nations; “sea people” and territory; colonialism; piracy; interrelation between people and natural environment; ships and the sea in myths, narratives, and visual culture; seafaring as a method of understanding Southeast Asia, and so on. The module will take place during Semester 3 (13 May – 21 June 2019). There will be seminar-type classes during the first weeks, followed by a 10-12 day voyage in the later part of the semester (i.e., in the first half of June). In the pre-voyage seminars, students will learn about sea, islands and vessels, as well as basic Indonesian, basics of seamanship, and together we will plan the voyage and its creative documentation. We may also go on local fieldtrips. There will be no final exam; focus will be on participation and individual and collective projects. Students will gain a new perspective on our region – from the sea –, experiencing and learning about places, communities, ways of life, and cultural/economic links that they would be unlikely to get to know otherwise. They also gain a first-hand experience of the sea and seafaring: the seascape alive with currents and tides, the changing wind and weather, the life in the miniature world of the boat. The destruction and preservation of natural environment is another pressing issue, whose urgency is seen when one sails in Southeast Asia. Each year, the voyage may have a different itinerary or explore a different maritime/archipelagic area (e.g., Riau Archipelago in Indonesia, islands in Southern Thailand, or parts of the Philippines). Students will be learning both about maritime Southeast Asia in general, and – as a kind of case study – with focus on the particular region to be explored (its specific historical, economic, political, cultural, and environmental issues). Additionally, students will learn the basics of sailing and navigation, which will enhance their understanding of sea and seafaring. 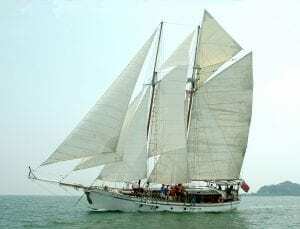 It assumes that we will be able to charter a motor-sailing boat, which is most likely but not guaranteed. In case it is not possible, an alternative trip will be organized, probably using ferries. Please see the Annex in the Application Form for important preliminary information about the fieldtrip. You can find pictures and videos from past voyages here: https://www.facebook.com/nusseafarers/ and a blog created by students from a recent voyage here: https://blog.nus.edu.sg/borneoduewest/. Neither of these voyages were part of a module, but the FB page and the blog should still give you some idea about the planned voyage. Moreover, the blog should give you a sense of the kind of documentation we will be doing. Students are expected to pay a sum of S$1,200 to S$1,600. Visa fee (where applicable) and additional personal expenses are borne by the student. Singapore Citizen and SPR students are also eligible to obtain funding support up to S$500 from the NUS Global Relations Office to help defray the cost of the trip. In addition, Singapore Citizens and SPR students who are not in their last semester can apply for an additional $800 subsidy (YTP). Details for funding support applications will be provided to participants at a later date. NUS Students can download the application form here: https://bit.ly/2JOx6zn (Sign in with your nus student email, i.e. e01234567@u.nus.edu.sg). Complete application form are to be submitted via email to fasbox59@nus.edu.sg by the stated deadline. Shortlisted candidates may be required to attend an interview. We look forward to receiving your application. Students registered for SE3234 will have priority for the associated voyage, other NUS students and alumni may apply and will be accommodated if there are available spots. Write to Assoc Prof Jan Mrazek at seajm@nus.edu.sg or Administrator at fasbox59@nus.edu.sg.